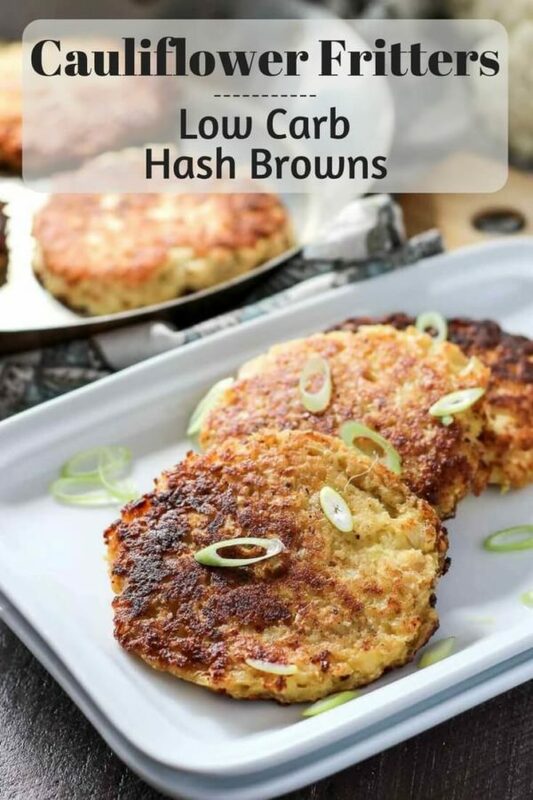 Low carb cauliflower hash browns are easy to make and very versatile – think base, snack or side. They also make the perfect low carb hash browns for ketogenic diets! You’ll love this gluten-free recipe! I’ve been obsessed with vegetable fritters since I made zucchini fritters last week. I’ve been serving them with everything. Fritters make a fantastic low carb base for eggs, are a tasty little snack in the afternoon and do double duty as a great dinner side. And, they make great low carb hash browns! There’s no need to cook the cauliflower before making the fritters for this recipe. 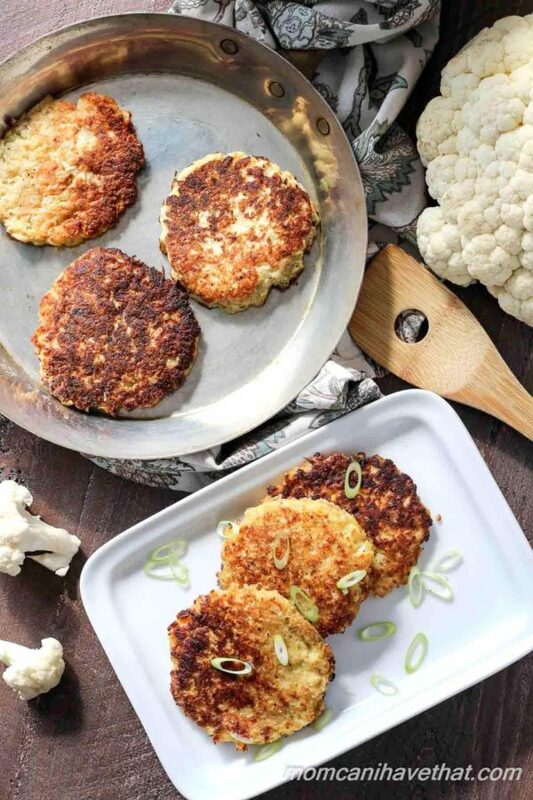 I’m a busy mom and there are some recipes for which I am willing put in the extra time, but I think cauliflower fritters should be fast and easy. Weigh 1 pound of cauliflower florets. Grate the cauliflower in a food processor or use a box grater. Salt, let sit, and squeeze out the moisture from the cauliflower. I bought a new non-stick ceramic skillet at Target a few weeks ago. Have you seen the Green Pans yet? They are so slippery I have to use baking spray in them instead of oil. Oil won’t coat the pan because it runs to the other side as the pan is tilted – no matter what I try. You only need a little baking spray to get the job done. Eggs slide right out of the pan and onto my plate. No sticking! I used my cast iron skillet on the batch in the picture. They browned nicely, but had a tendency to stick until they were well-browned. I used more oil in my skillet than I would need with my new non-stick pan. 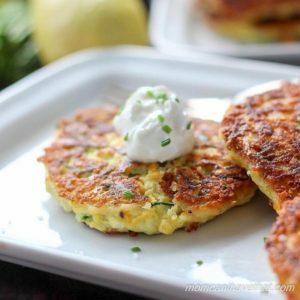 All of these variations make a delicious upscale and tasty hash brown side with breakfast or low carb cauliflower hash browns (minus the bacon). Yum! 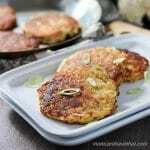 Cauliflower fritters are super easy to make and very versatile - think base, snack or side. They make the best low carb hash browns! Kids love 'em! Grate the cauliflower and put it into a colander, sprinkle the salt on top and mix thoroughly with your hands. Let the cauliflower sit for 10 minutes. Meanwhile, chop the onions and place them into a medium bowl. With clean hands, squeeze the water out of the cauliflower and put the cauliflower into the medium bowl with the onions. Add the almond flour, cheese, baking powder and seasoning. Mix thoroughly. Add the three eggs and mix until incorporated. Oven Method: Preheat oven to 400 degrees F. Line two cookie sheets with parchment. Measure 1/4 cup of batter per fritter and flatten out into a circle. Bake for 10-12 minutes, flip and bake for 10-12 minutes more. Store in the refrigerator. Re-heat in a dry skillet over medium heat to make crisp again. A reader just commented that she used store bought riced cauliflower and her fritters turned out crumbly. I grate my cauliflower on a box grater or use the grating blade on my processor. My fritters have never been crumbly. I advised her to use another egg and a little more cheese next time. Made these tonight as an alternative for hamburger buns & it was delicious! Trying these next with eggs Benedict. Since staring a low carb diet, one of the breakfast foods I was missing most, were my beloved hash browns. I tried this recipe and have found a very satisfying alternative to the traditional potato patties. Very tasty? I would like to make these… But in a waffle iron. :-) Has it been tried? Does the batter seem to have the right consistency for a waffle iron? Thanks. Is there an alternative to the almond flour for your recipes? Unfortunately I’m allergic to almonds. Used this recipe for pizza crust, so amazing!! made these today and they are delicious. I added scallions an garlic powder. added one extra egg too since I bought pre bought riced cauliflower. came out perfect. thanks for the idea! I made these cauliflower has browns for dinner tonight. My very picky husband ate the first, and went back to the kitchen to get two more! I had a bag of prepared cauliflower rice that I needed to use. I added extra onion, garlic, and real bacon bits. I had both shredded and grated Parmesan so I used some of both. I made a half batch using about 3/8 c. almond flour and two eggs. Once everything was mixed, I smushed it all to the bottom of the bowl since it didn’t want to hold together – that took care of that! I used the frying method with a tablespoon of olive oil and it took about 5 minutes per side over medium heat. Absolutely delicious! Can the cauliflower fritters be made ahead of time and refrigerated or frozen? I have some riced cauliflower that would be perfect for this recipe. Just started Keto method of eating, looking forward to more great recipes. Nice recipe! For those looking for an alternative to almond meal; Ground pork rinds work well in most recipes as a bread crumb or binder substitution – and adds zero carbs. What can be substituted for almond flour. I have an allergy. Looking for low carb recipients. This sound good. Trying it for dinner tonite. Love these things, but Almond flour is very expensive here in Powell River. Made a batch using the considerably cheaper Coconut flour instead (1/4 cup) and find it works even better, yielding a slightly drier pattie, with 4 eggs instead of 3. Can’t get enough of ’em. Thanks for the recipe. I’m a little confused as regards the nutrition data included with the recipe. It’s says there are 12 servings, but also says a “serving” is 1 g. Really? Each patty weighs just 1 gram? Made these for the first time. Turned out perfect. No bloating like I would get with piratoes. Plus the hubby loves them too. I added 75 g of cooked crispy bacon and dipped them in blue cheese dressing. Oh man man man so good! I just made these, they turned out amazing! I used the rice cauliflower and took your advice and added an extra egg and extra Parmesan. I used garlic pepper instead of lemon pepper and added crumbled bacon and scallions. Turned out great! These were amazing~ I fried in batches of 4- the first ones i used this recipe with the lemon pepper- they were a little crumbly so i mixed a bit more cheese and a tblsp of almond flour in the remaining mixture. I used a siracha lime dry spice mix to the next few – YUM. The mixture was a bit more wet at the bottom so i just fried those up like hash brown and they were great- very crumbly though. Served them up with bacon and what a great lunch or breakfast. Love keto- love the recipes, thank you. Oh man this sounds yummmmy! I think maybe I can do the keto diet and love it withall these delicious sounding recipes! Excited to get healthy again and not eating bland cardboard tasting food to get there! Thanks for the amazing recipes! I’m making these right now. They are holding together just fine and they smell so good. Just tried this recipe, and it was incredible! I used a food processor with a grater attachment to finely grate my cauliflower then let it dry. I squeezed out the remaining water as much as I could–basically just grabbed handfuls of cauliflower mash and squeezed, then went through the whole batch again. I think that drying the cauliflower as much as possible helped. Other keto fritter recipes I have tried have fallen apart, but these held together well (as long as I didn’t flip them too early). For my version, I added some cajun seasoning and pan-fried them in butter rather than oil. I also don’t have a kitchen scale so I had to approximate the measurements–I used 2 1/2 cups of grated cauliflower (before drying, about half the head) and 1/3 cup of onion. The onion doesn’t need to be chopped very finely, I used coarsely cut onion and liked the texture. Overall a very good recipe that I am eager to try again. One of those recipes that makes it easy to eat keto! Tried these yesterday for dinner as compliment to pork chops. Used plain flour instead of almond flour as I had none. Were simply awesome. Great hit with my partner. Will definitely be doing these again. I used ground up Baconets in place of flour for really low carb count. Great snack. Hi – great looking recipe. Do you suppose it is possible to sub out the almond flour with coconut or some other? Nut allergies. Thanks. Life. Changing. These are so amazingly good I could eat them every day (and have been!) Make a big batch on the weekend, keep in a container in the fridge, and just grab a couple for lunch each day. Sour cream is really all you need but honestly great with everything. My husband is not eating low carb and doesn’t love cauliflower and loves potatoes but now only wants these also. Thank you for this recipe! Want to try the zucchini ones next. This was so good. I added sauce, cheese and pepperoni and made mini pizzas. I’m anxious to try this recipe (trying to be creative and get our daughter to eat more veggies)! We don’t have any gluten allergies–I was wondering if you knew the estimate for regular unbleached flour in lieu of the almond flour? Just made the broccoli fritters and they were amazing! I added some sautéed onions & garlic powder. My daughter and I were fighting over them. Thanks! Just made my first batch…cooked half in the oven and half in the skillet. Both were awesome!!! I didn’t have lemon pepper so just used a little garlic powder but yummy!! The best recipe i’ve tried. Good evening. Does the cauliflower need to be cooked? Kim, made this for dinner tonight and loved them. These are going to be a regular at my house. I often make “faux potato pancakes” out of leftover cauliflower mash but have never made them from scratch this way. These were so great. Note: Whenever I make a recipe where excess moisture is undesirable, I often use old cheapo canned grated parmesan instead of the good stuff. The canned stuff’s (i.e. Kraft and other store brands) dryness is actually as asset here, and I save my Parmesean Regiano to top dishes where its quality shines. Canned grated parmesan also is great for breading things, mixed in equal parts with ground golden flax seeds and almond flour. I made tonight’s cauliflower fritters a bit bigger (about rounded 1/3 of a cup each) and formed them into patties before putting them in the skillet (greased my hands first). I also used only 1 egg to make half of batch, and that worked really well. Added sliced scallions for the onion, and threw in some shopped cilantro that needed to be used up before it went bad. Like your photo, the flecks of green in it were sooooo pretty. And I forgot to add the baking powder…..did not seem to make any difference. Had one patty leftover from dinner….can’t wait to have my new hashbrown lookalike for breakfast with my eggs tomorrow. I really loved these….thanks for the great recipe. I have a terrible weakness for hash browns. The rolls on my belly are here to prove it. 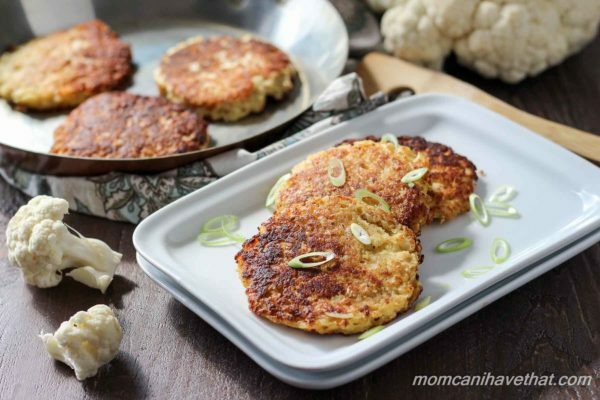 I can’t wait to try these Cauliflower Fritters….. My tastebuds and waistline will both be happy! Thanks for the great recipe. xoxo! Do you use the parmesan cheese in a shaker container or the really good Parm? I have both but curious to see what you use. I am thinking the green top has more “fillers”. Cauli fritters look great! I saw you mention that you use spray oil in your pan. I advise you don’t do this anymore as it’s been discovered that over time, your non-stick surface will lose its non-stickiness! It’s happened to me countless times until I discovered this fact. I had a pan that it had happened to and it wasn’t just a cheap one so I got online and researched and since I’ve stopped using spray oil and been using just a drizzle of oil or butter rubbed around, I’ve managed to save it and now it’s coming back to life!! Wouldn’t want your nice new pan being spoiled. Hi! Sounded yummy so I made these for breakfast. They were delicious but they were not patties. The ‘batter’ was very try and ended up more like a crumble than patties. I used already riced cauliflower from the store which produced no liquid when left in the colander with the salt. That is the only thing different from your recipe. Any ideas? Thanks Kim. The cauliflower was raw. I will try more cheese and another egg next time. These look fabulous! I will definitely be trying them soon. Just out of curiosity, do you prefer the skillet or the oven method of cooking them? Thank you for this recipe. This is awesome!!! Ha! Just picked up a bag of cauliflower rice at Trader Joe’s yesterday with no recipe in particular in mind. This fits the bill perfectly, Kim! Thanks! Hi Kim, these look great. Do the onions get cooked through? Or are they crunchy? Just wondering how critical the parmesan is in this recipe? I’m dairy and soy free, but would love to try these – what, if any, substitutes might you suggest from the cheeses in this recipe? Hi, your basic cauliflower fritter nutrition facts are covered up by weight watchers ad with NO way to delete it! Could you send the nutrition facts to me? Can I use frozen riced cauliflower? 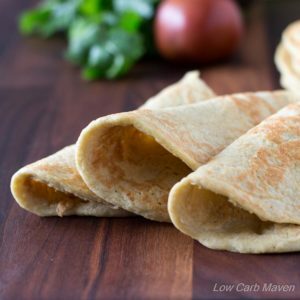 I’ve recently been diagnosed with type 2 diabetes & need to find great low carb recipes. These sound like they would fit the bill. is there a substitution i could use for the almond flour (that is not coconut flour)? ground up pork rinds? flax meal? Hello can I confirm if baking SODA or baking POWDER is used? The ingredients list and instructions show each one. This reminds me of okonomiyaki. It’s a Japanese pancake that uses cabbage and thin sliced pork. I think I’ll make this tonight! Thsnks! Good to know that low carb can taste like great and like real food. It’s my Favourite cauliflower recipe. Nothing ‘basic’ about this. I truly think that cauliflower has become a regular thing. It’s excellent on its own. Even better like this! I am so glad I found this post!! I made these tonight with frozen cauliflower!! They were wonderful!! I let the cauliflower thaw in the bag, the shredded them. The bag I used was 16 Oz & I only needed two eggs instead of three!! My hubby & oldest kiddo loved them!! These look so good! I am definitely trying these this weekend! I used to hate cauliflower, but that’s because I only knew of the mushy frozen kind. When it’s got the kind of crispy char you have goin’ on here, it’s a totally different story. I’ll take seconds!